MONDAY, Jan. 22, 2018 (HealthDay News) — In yet another example of how far-reaching the fallout from America’s opioid epidemic is, researchers report that babies exposed to these narcotics while in the womb run the risk of certain head and neck abnormalities. One is a twisting of the neck (torticollis) and the other is a flattening of the head (plagiocephaly), which often occurs in tandem with torticollis. In the study, doctors at Cincinnati Children’s Hospital Medical Center looked at 783 infants born over five years, and found that 87 (11 percent) of those exposed to opioids in the womb were diagnosed with torticollis. In 1994, the rate of torticollis in the general population was 0.3 percent to 1.9 percent, the study authors noted. “Awareness of these potential issues in this population is essential, as torticollis may not develop for several months after the infant has been discharged from the hospital,” said study author Dr. Jenny McAllister. 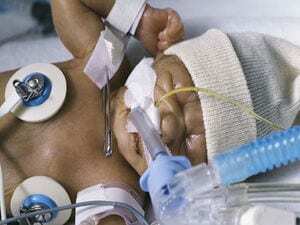 Neonatal abstinence syndrome (NAS) is triggered by withdrawal after exposure to opioids in the womb. The incidence of NAS rose almost fivefold between 2000 and 2012. “If preventive measures are performed — such as occupational and physical therapy — torticollis and plagiocephaly may be avoided and potentially prevent developmental delays,” McAllister added. It’s not known if opioid exposure in the womb actually causes torticollis. These infants could have a tightness of their muscles (hypertonia) that predisposes them to torticollis, or the condition could be the result of swaddling that is done to keep them calm after birth, McAllister explained. Of the infants in the study, almost 76 percent were exposed to short-acting opioids, while just over 72 percent were exposed to multiple opioids. Infants in withdrawal were mostly treated with methadone, but 18 percent were treated with buprenorphine and close to 6 percent with morphine. Their time in the hospital averaged about 19 days. McAllister is a physician at Cincinnati Children’s and co-director of the Neonatal Abstinence Syndrome Long-Term Follow-Up Clinic. The study was published online Jan. 22 in The Journal of Pediatrics. America’s opioid epidemic is now so widespread that research suggests deaths from opioid overdoses may be the main driver of a drop in overall U.S. life expectancy. The American Academy of Orthopaedic Surgeons has more on infant torticollis.